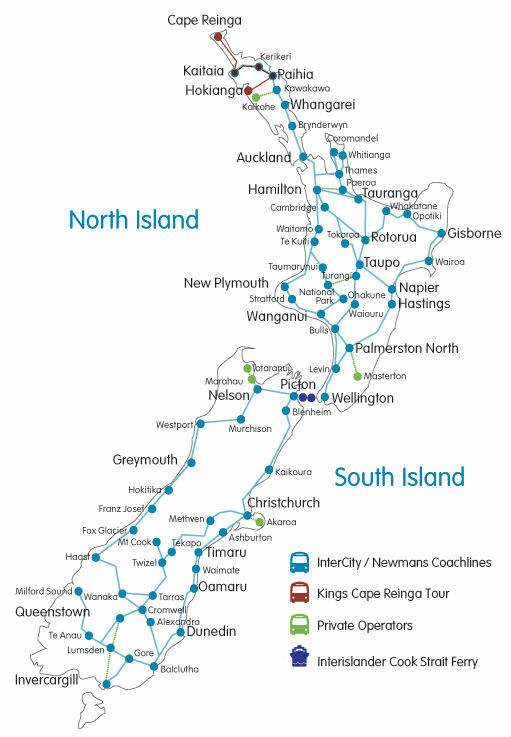 You can search for times, fares and make instant confirmation reservations to 500 communities, towns, cities, national parks, skifields, major tourist destinations and attractions including the destinations on the route map, on 130 daily services - 365 days a year, including the TranzAlpine train, on New Zealand's largest bus, coach, scenic coach and inter-island ferry travel network in association with Newmans, InterCity and Great Sights - with its scenic sightseeing travel services and tours. If you are experiencing problems in making your reservation or would like one of our travel consultant's to make a reservation/s for you, do not hesitate to contact our Travel Centre team. All fares are in NZ$/NZD and include local taxes. 1. To search for fares, departure times, seat availability or making a reservation, type in the 'From' field of the FareFinder search box located on the left of this page - the destination you are travelling from. 2. Type in the 'To' field, the destination you are travelling to. 3. Select your travel date, by clicking on the 'Calendar' icon next to the 'Depart Date' field. If travel is one way, do not select a 'Return' travel date. If want to search for return travel fares, times or make reservations, then select your return travel date, by clicking on the 'Calendar' icon next to the 'Return Date' field. 4. In the 'Passenger' field, select the number of people travelling including any children and/or infants. 5. Click on the 'Search' icon to display times, fares and seat availability. 6. To make a reservation, select the fare you wish to travel on and click on the 'Add to Cart' icon. Note - If you want to make reservations to other destination on the same reservation, on the Cart page, click on the New Search icon located under Cart top left of the page. Type or select the destination you want to travel from in the 'From' field and type or select the destination you want to travel to in the 'To' field, add your new Travel Date and click on the Search icon. Select the Fare Type you want to book and click on the Add to Cart icon. If you want to add other travel sectors, repeat booking process until you have booked all required travel sectors. If you want to add more travel sectors to your reservation, please repeat, the above procedure, until you have completed all the required travel sector/s you want to travel. 7. If you do not wish to add any other travel, click on the 'Book' icon to the 'Passenger Details' screen and click on Continue icon to Secure - Check Out and Confirmation to complete your reservation. 8. To finalize your reservation, follow the instructions for payment procedures. Once payment has been finalized, your E-Ticket/Itinerary will be emailed to the address you have used in your reservation. If you are using a public email account like Hotmail, Google, Yahoo, etc, please the Spam/Junk folder of your account, if your E-Ticket/Itinerary is not in your email 'In' box. If you are experiencing any problems in making your reservation or would like one of our travel consultant's to make a reservation/s for you, please do not hesitate to contact our Travel Centre team. Payment for all bus and coach services can be paid by a Visa or Mastercard credit, debit, prepaid/prepaid reloadable or travel card, Airpoints ONESMART debit Mastercard card or for New Zealand and Australian residents only - by internet banking using 'Poli' pay. Combined bus and Cook Strait ferry travel is available from Kaitaia, Kerikeri, Paihia (Bay of Islands), Whangarei, Auckland, Hamilton, Rotorua, Taupo, Palmerston North or Wellington to Christchurch, Kaikoura, Blenheim, Nelson or Picton, using the FareFinder - type or select 'Kaitaia, Kerikeri, Paihia, Whangarei, Auckland Central, Hamilton Central, Rotorua, Taupo, Palmerston North or Wellington Central' in the 'From' field and type or select 'Christchurch, Kaikoura, Blenheim, Picton or Nelson' in the 'To' field as your destination. If travelling from Christchurch, Kaikoura, Blenheim, Nelson or Picton to Wellington, Palmerston North, Taupo, Rotorua, Hamilton, Auckland, Whangarei, Kerikeri, Paihia (Bay of Islands) or Kaitaia - type or select 'Christchurch, Kaikoura, Blenheim, Nelson or Picton' in the 'From' field and type or select 'Wellington Central, Palmerston North, Taupo, Rotorua, Hamilton Central, Auckland Central, Whangarei, Paihia, Kerikeri or Kaitaia' in the 'To' field as your final destination. To make reservations to other destinations on the same booking/reservation, follow the steps in paragraph 6 under Making Reservations. If you are experiencing any problems in making your combined bus and ferry reservation or would like one of our travel consultant's to make a reservation/s for you, please do not hesitate to contact our Travel Centre team. You can book combined TranzAlpine train and bus travel from Christchurch to Nelson, Murchison, Westport, Punakaiki, Hokitika, Franz Josef Glacier using the above FareFinder. a. To make a reservation - type or select 'Christchurch' in the 'From' field and type or select 'Nelson, Murchison, Westport, Punakaiki, Hokitika, Fox Glacier or Franz Josef' in the 'To' field as your destination, your Travel Date, the number of people traveling and fare type/s and click on the Search icon and a new browser tab will open with your travel Search Results on it. b. Select the Fare type you want to book and click on the Add to Cart icon. c. To complete your reservation, click on the Book icon, add Passenger Details and Payment Details to complete your reservation. d. If traveling from Franz Josef or Fox Glacier to Wanaka or Queenstown, you will need to add another travel sector to your Christchurch to Franz Josef or Fox Glacier travel, on the Cart page, click on the New Search icon located under Cart top left of the page. e. Type or select 'Franz Josef or Fox Glacier in the 'From' field and type or select 'Wanaka or Queenstown' in the 'To' field as your destination, add your new Travel Date, and click on the Search icon. Select the Fare Type you want to book and click on the Add to Cart icon. If you want to add other travel sectors, repeat booking process in para c until you have booked all required travel sectors. f. Once all travel sector/s have been added, click on the Book icon, add Passenger Details , click on Continue icon to Secure - Check Out and Confirmation to complete your reservation. g. Once your payment has been process, your Ticket/Itinerary will be email to you. You can book combined bus and TranzAlpine train travel from Nelson, Murchison, Westport, Punakaiki, Hokitika, Franz Josef Glacier or Fox Glacier to Christchurch using the FareFinder. To make a reservation - type or select 'Nelson, Murchison, Westport, Punakaiki, Hokitika, Fox Glacier or Franz Josef' in the 'From' field and type or select 'Christchurch' in the 'To' field as your destination. If traveling from Queenstown or Wanaka to Fox Glacier or Franz Josef, you will need to add another travel sector to your Queenstown or Wanaka to Franz Josef or Fox Glacier travel, on the Cart page, click on the New Search icon located under Cart top left of the page. Type or select 'Queenstown or Wanaka in the 'From' field and type or select 'Fox Glacier or Franz Josef' in the 'To' field as your destination, your new Travel Date, and click on the Search icon. Select the Fare Type you want to book and click on the Add to Cart icon. If you want to add other travel sectors, repeat booking process in para c until you have booked all required travel sectors. If you are experiencing any problems in making your combined bus and train reservation or would like one of our travel consultant's to make a reservation/s for you, please do not hesitate to contact our Travel Centre team. Reservations can be made for drop off options at Christchurch International Airport on northbound InterCity bus and coach services from Invercargill, Te Anau, Dunedin, Timaru, Oamaru, Ashburton to Christchurch and Great Sights scenic coach services from Queenstown Twizel, Lake Tekapo and Mt Cook by typing or selecting in the FareFinder 'From' field your departure location and type or select 'Christchurch Airport' in the 'To' field, as your Christchurch airport drop off location. Airport pick up or drop off for InterCity coach services between Christchurch, Twizel, Lake Tekapo, Wanaka and Queenstown - type or type or select 'Christchurch Airport' in 'From' or 'To' as your Christchurch airport pick up or drop off location. There are no Christchurch airport bus services to or from Kaikoura, Blenheim, Picton or Nelson. Reservations can be also made for travel to/from Auckland International Airport to Auckland city and to other destinations outside the greater Auckland urban region either from the International or domestic terminals. Using the Farefinder search box located on the left, in the 'From' field, select either 'Auckland International Airport' or 'Auckland Domestic Airport' and in the 'To' field, the destination you want to travel too.